PennsylvAsia: 国際機関就職ガイダンス2018, January 29 at Chatham University. 国際機関就職ガイダンス2018, January 29 at Chatham University. 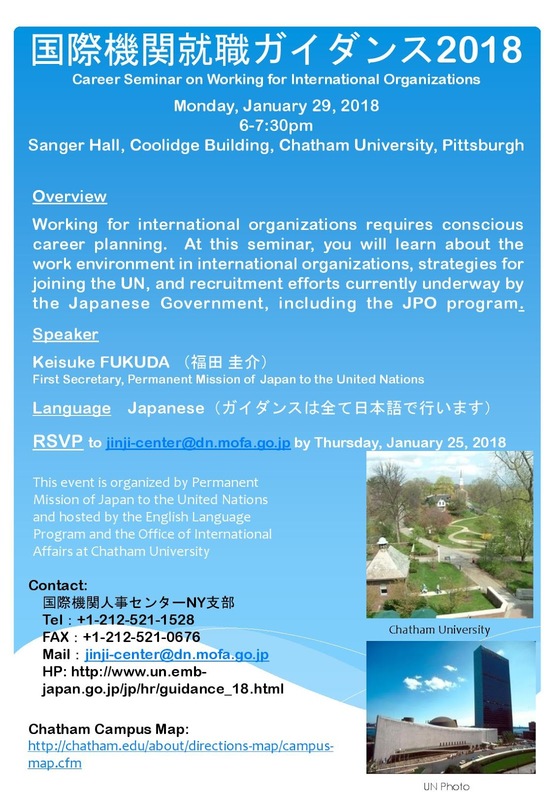 Chatham University will host Keisuke Fukuda (First Secretary, Permanent Mission of Japan to the United Nations) on January 29 for a Japanese-language career seminar on working for international organizations. Working for international organizations requires conscious career planning. At this seminar, you will learn about the work environment in international organizations, strategies for joining the UN, and recruitment efforts currently underway by the Japanese Government, including the JPO program. RSVP is required and can be made by emailing jinji-cener at dn.mofa.go.jp by the 25th. The Coolidge Building is located on Chapel Hill Rd. on the campus of Chatham University in Squirrel Hill (map).